The film PM Narendra Modi is set for release this Friday and the soundtrack has been unveiled too. 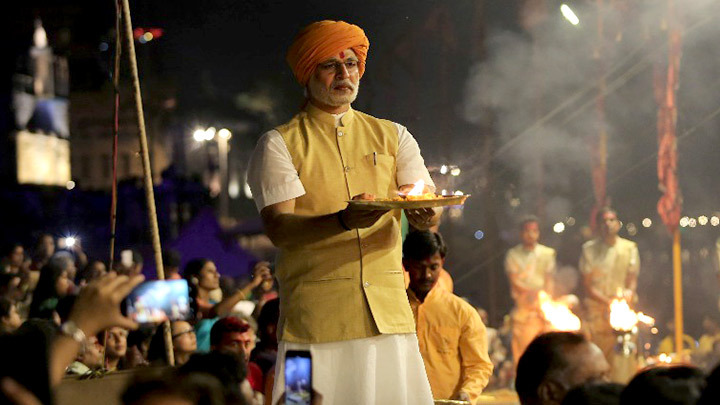 Given the fact that the film is a biopic, one expects patriotic flavour in this music of PM Narendra Modi which has multiple composers and lyricists collaborating to bring together half a dozen songs. Prasoon Joshi is the lyricist of the opening number ‘Saugandh Mujhe Iss Mitti Ki’ that is composed by Shashi – Khushi and has Shashi Suman singing in a manner that is reminiscent of Sonu Nigam. He is joined by Sukhwinder Singh behind the mike and together they actually come up with a decent outing that reminds one of the kind of music that A.R. Rahman’s Lagaan carried. ‘Namo Namo’ has been a prominent slogan for last half a decade and that turns out to be the hook-line of the song. A rap number that is written and rendered by Parry G, this Hitesh Modak composed track is high on intensity and aims at being a power packed outing. Producer Sandip Ssingh too debuts as a singer with this theme song that has Lavaraj as the lyricist as well. Shankar-Ehsaan-Loy and Sameer’s ‘Hindustani’ was a huge hit when released back in time for Salman Khan and Sanjay Dutt’s unreleased Dus. The song is presented in a new avtar with Parry G’s rap kick-starting the proceedings and Sardaana writing added lyrics. This time around it is Shankar Mahadevan’s son Siddharth Mahadevan who takes over the mantle and is joined by Shashi Suman as the singer. The overall impact is lacklustre though, as is the case with most of the recreations that are heard first. Shashi-Khushi and Sadaraa come together for ‘Fakeera’ which turns out to be a rather dull outing. Very old fashioned and just not the kind of number that can be expected to make an impression amongst today’s audiences, this Raja Hasan and Shashi Suman rendered track belongs to the quick-skip variety. The song which follows next turns out to be even duller, what with composer Hitesh Modak and lyricist Lavraj not really managing to entice any patriotic reactions. Based on Indian classical music, ‘Junoon’ is sung by Javed Ali and though the singer does try, the ordinary tune and the arrangements that accompany it don’t really help the cause. The soundtrack concludes with Suvarna Tiwari rendering ‘Ishwar Allah’ which had featured in A.R. Rahman and Javed Akhtar’s 1947 Earth. Hitesh Modak recreates the song along with lyricist Lavraj and though the ‘sur’ is in synch with the mood of rest of the album, it doesn’t quite entice you much to go for a repeat hearing.